Among the possible reasons are disorientation from artificial lights for birds on long-haul migrations at night. Compiling data from all kinds of buildings, the team found that Anna's hummingbirds, black-throated blue warblers, ruby-throated hummingbirds, Townsend's solitaires and golden-winged warblers topped the risk list. The study also found that while skyscrapers might be the tallest part of the bird collision problem, they aren't necessarily the biggest contributor. 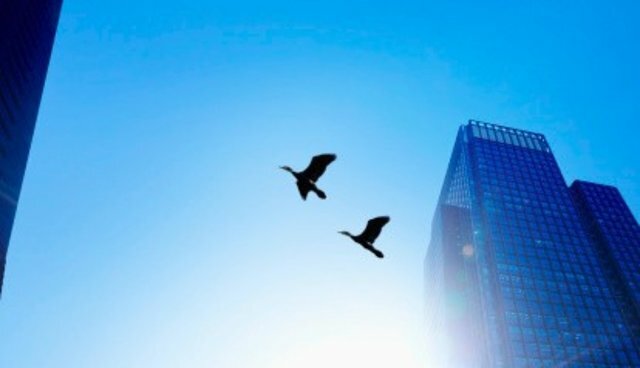 Although an average of 24 birds will have a fatal crash with a single skyscraper each year, there simply aren't as many skyscrapers for birds to collide with as there are smaller buildings. In fact, most window collisions occur on the country's millions of low buildings. Research has shown that birds would be more likely to avoid windows if they could only see them, either with the help of opaque markers, such as stripes or dots or with ultraviolet light. One company has already begun marketing "bird-safe" glass, which relies on a special layer of UV window coating that is transparent to humans but visible to birds. Some ornithologists are skeptical of birds' ability to perceive UV-reflective coating while in motion; others, however, suggest that applying the coating in patterns could sharply reduce the number of bird collisions each year. A key obstacle, though, is getting people to use patterned glass in their buildings. Some locales have made efforts to enforce new bird safety standards by law, though the trend has yet to spread nationwide. Minnesota and the city of Oakland both mandate bird-friendly designs for new buildings, and San Francisco, which passed its "Standards for Bird Safe Buildings" in 2011, is a leader in trying to prevent glass massacres. But, while it would be helpful to enforce similar safety guidelines on a wider scale, there are also steps individuals can take to make structures less dangerous for birds, such as including window screens, closing shutters, or even decorating glass with washable paints.